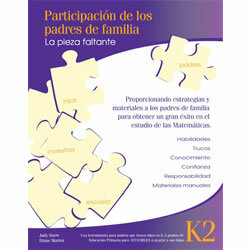 Kaplan offers products that will introduce basic math concepts to bilingual learners. Products include CDs, books, clocks, a Latin instrument set, and an English and Spanish talking cube. Grades K - 2. 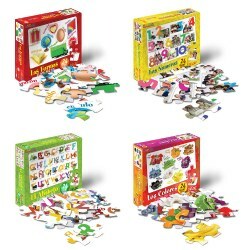 A pack of 20 activity cards and 4 dice provide extra learning activities for kindergarten through second grade students at home. Parents become partners as they work through each simple, but powerful activity, reinforcing important grade level skills in math. Available in English and Spanish. Grades K - 5. This Parent Guide contains strategies, tricks, tips, examples, explanations and vocabulary to empower parents of Kindergarten through 5th grade students. A great way to get parents involved in reinforcing student learning at home or helping with homework. Spanish version. Grades 3 - 5. 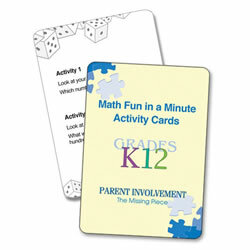 A pack of 20 activity cards and 6 dice provide extra learning activities for third through fifth grade students at home. Parents become partners as they work through each simple, but powerful activity, reinforcing important grade level skills in math. Spanish.